The AG-DVX100BE allows camera-to-camera time-code synchro and user-settable file transfer. 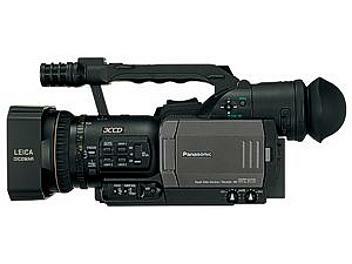 Therefore the AG-DVX100BE can be used for simultaneous multi-camera recording techniques often used in video production. Synchro Scan Shutter Speeds: 50i mode: 1/50.2 to 1/248.0 sec. 25P mode: 1/25.1 to 1/248.0 sec. Slow Shutter Speeds: 50i mode: 1/3, 1/6, 1/12, 1/25 sec. 25P mode: 1/3, 1/6, 1/12 sec. Tape Speed: SP mode: 18.831 mm/sec., LP mode: 12.568 mm/sec. This machine is working perfectly..